There are a million reasons—academic and social—why high school can be quite an ordeal for kids. So a Toronto LGBTQ advocacy group has created a unique poster, put up in schools across the city, that uses a camera phone’s flash to reveal a secret supportive message about gender identity and sexual orientation. 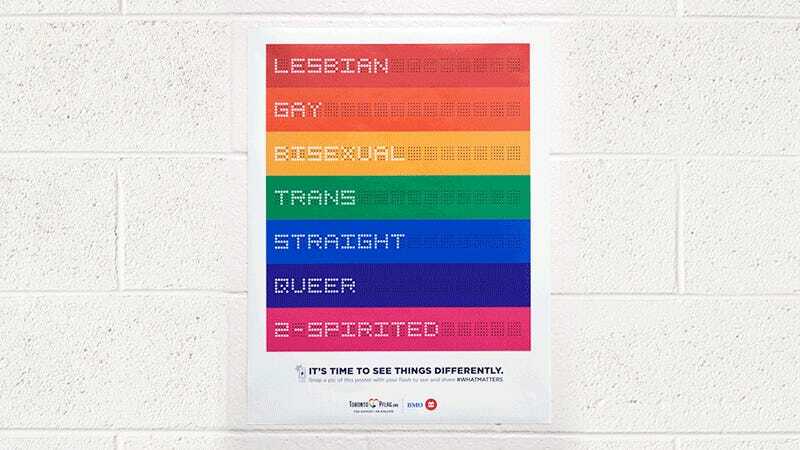 The poster, created by Toronto Pflag and ad agency J. Walter Thompson Canada, features a rainbow spelling out the LGBTSQ acronym (lesbian, gay, bisexual, trans, straight, queer, and 2-spirited) on the left side. But when photographed using a camera phone with the flash turned on, the right side of the poster reveals that LGBTQ people are actually friends, teammates, and people they already know. A special printing process was developed for the poster, which involved the use of reflective inks similar to the glowing materials used in reflective clothing worn by cyclists. And by making it interactive, requiring students to actually snap a photo to reveal the poster’s secret, it helps ensure the important message doesn’t get ignored and lost amongst all the other messages high school kids are bombarded with.